Recorder’s Office Opened in 1903. In 1903 a Deputy Mining Recorder’s office was opened, in charge of John Conway. The office was a log building and stood on what is now second street. 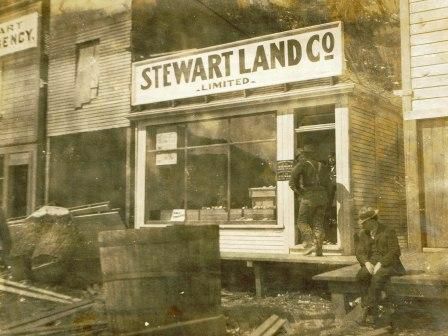 It was the second building to be erected in the settlement and was burned down a few years later. The first house was one put up by Rainey in 1899, which is still standing on the west end of Sixth Street. Previous to the opening of the Recorder’s office, the nearest point where a claim could be made was Port Simpson, which entailed a trip of 125 miles each way in an open boat. The gasoline engine was then in it’s infancy, and was unreliable and prone to break down on the job when most needed. The first motorboat to be used on this section of the northern coast was one belonging to M. K. Rodgers, who used it in connection with the work he was then doing opening up the copper property at Anyox. The engineer in charge of the boat had all kinds of trouble with the engine, and every time he had a trip it was a case of prime and crank till he got it running. One day after a long spell at the crank, with no results he said feelingly: “If gasoline motors had been invented back in the Bible times, and the Almighty had inflicted Job with a gasoline engine, he’d have cussed him and died the first crack out of the box.” Sometime later while towing a scow loaded with supplies for the mine, a gale blew up and while rounding a point on the side of which was safety, the motor quit, as usual, and boat and scow piled up on the rocks. The crew was saved their lives and the motorman was happy with his affliction at the bottom of the sea.